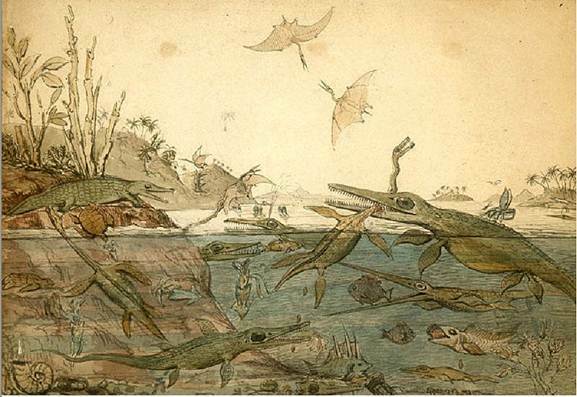 Duria Antiquior famous watercolor by the geologist Henry de la Beche. From Wikimedia Commons. The Zoology Museum was established in 1969 as a teaching museum for the University of New England. The exhibits focus on the anatomy, taxonomy and evolutionary relationships within major Zoological groups and include several fine sequences of associated fossils. In the foyer, there is a display of old instruments used in the study of animals and animal tissues. Many common Australian animals are displayed and fauna of the New England region is well represented. Of particular interest to the general public are the animals that are venomous and dangerous to humans; search for the red marker by their names! Children, animal lovers and biology fans alike love our museum but everyone is welcome here.